Now this is how you follow up last year’s The Avengers. Ladies and gentlemen, welcome to Marvel’s Phase II. Though Iron Man 3 ushered in the next phase of Marvel’s master plan for the Avengers, it’s Thor: The Dark World that really lives up to the legacy set forth by last year’s mega blockbuster. While Tony Stark was suffering from PTSD earlier this summer after “The Battle of New York” in last year’s The Avengers finale, Thor was out actually doing stuff–and that’s where this movie really shines. This is Thor’s movie, and everything going on in the film is centered around him. Sure, we get a few offhanded references to the events of The Avengers, but it’s not a major plot point, and neither is S.H.I.E.L.D. Through and through The Dark World is exciting to watch because Thor has the right villain to contend with. Malekith, an old enemy long forgotten, returns and not only threatens Asgard, but Earth, the entire nine realms, and Thor’s relationship with Jane as well. Malekith is bent on having revenge, and this creates stakes and consequences that Thor must contend with. Odin: I never did like that Black Swan movie. What really makes the film entertaining is that Thor and his world really get fleshed out. Since much of the film takes place on Asgard, the family dynamic with Thor, his father Odin, his mother Frigga, and his brother Loki (more on him later) is examined and built upon. With Odin preparing to pass rulership onto his son, is Thor ready to take on the role of king of Asgard? At the end of the first film and even after The Avengers, it seems as if Thor is ready. Yet by the end of this film, that answer won’t seem so simple. Thor is further defined by his relationship with Jane Foster, and this too gets a fair amount of focus in the film. Due to the complexities of their relationship (he being a god and she being a mortal) as well as his responsibilities to Asgard (and that whole long distance thing), the doomed romance angle is there for us to latch onto. One thing I think that made this film relatable was that the Asgardians didn’t seem all that high and mighty. With the filmmakers taking us to Asgard and portraying it in more of a medieval light, it didn’t seem as fanciful and otherworldly as it did in the first film. Granted they still had tech that was beyond us mere mortals, but with enemies that had powers on a level comparable to their own, coupled with the many hand-to-hand combat battles that took place in the film, it all seemed more down to earth and relatable. Loki: Are you sure I can’t be in the Avengers sequel brother? A highlight of The Avengers was the presence of Loki. In Thor: The Dark World Tom Hiddleston chews up the scenery left and right and again makes the character one of the high points of the film. All the rage, cunning, and manipulativeness of Loki is there, and since it’s a Thor film, we get to see him earn his keep. What was thrilling to see was something that’s been hinted at in the trailers . . . Thor has to team up with Loki. Can Thor really trust his “brother”? Will Loki redeem himself? Both of these questions come into play and are answered beautifully by Loki’s actions in the film. At the end of the day Marvel has a great character on their hands, and they are able to use him very wisely. Thor: The Dark World is thoroughly entertaining due to the relatability of the story. Thor is the god of thunder, but yet he’s grounded and empathic to us due to points that are highlighted in the film. He’s part of a family, and he has to deal with drama with his dad, mom, and brother. He’s in a complicated relationship and has to deal with all the baggage associated with that. He’s made to seem more mortal (and beatable) due to the fact that his enemy is just as powerful as he is. You take all these things, sprinkle in a lot of that humor that we’ve been getting from the last couple of Avenger movies, and some good action scenes, and you’ve got all the ingredients to a great film. Speaking of great films . . . when is the next Thor movie coming out? I can’t wait. 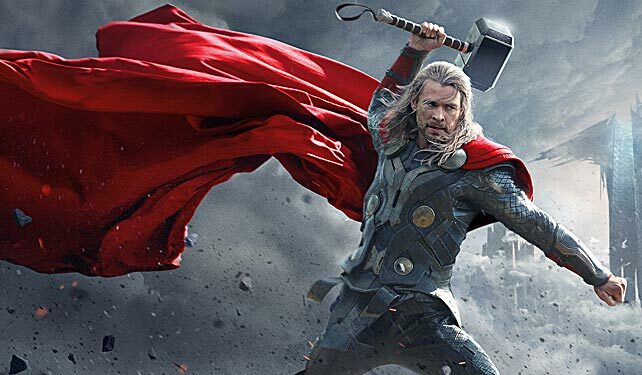 Thor: The Dark World is now playing in theaters everywhere. Good review. Not perfect or as good as the first, but still well worth the watch to get out of that cold weather outside, and just enjoy the nice warm, positive breezes this movie gives off of the screen.